With Thanksgiving less than two weeks away, I think about these special times and how they inspired my love affair for planning special events and weddings many years ago. As a little girl I would help my Grandma in her kitchen preparing holiday dinner parties. So, I thought it would only be right by starting my very first blog post in honor of my Grandma Klapper. If you are hosting Thanksgiving dinner, here are a few fabulous ideas for tablescapes & decor. 2. 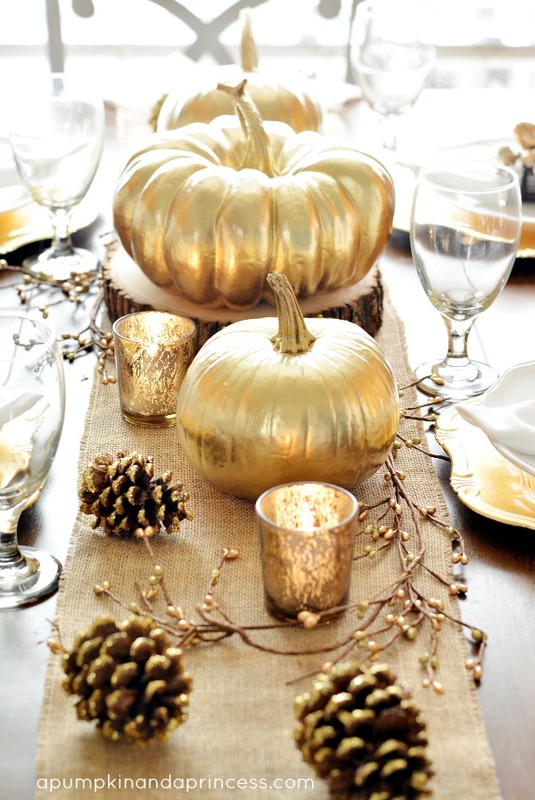 Glam Thanksgiving with gold accents that include DIY gold spray painted pumpkins and gourds, gold charges or gold paper plates. Create natural elements with a burlap table runner, pine cones and wood bases. 4. Rustic Glam with eggplant paper dahlias and gilded leaves mixed with metallic accents and gray chargers gives off a beautiful ambience. 5. Modern but traditional with bright oranges and grays makes for a fabulous tablescape. Love these white square plates that can be found at Target. 7. A classic "cottage" feel with this mix of blues and oranges. You can mix and match different china plates if you don't have all matching ones. I also love the milk white glass platter that incorporates beautifully in with this color scheme.